Brake cylinders recovered from Booths Four RRRG volunteers braved the freezing conditions on 4th January 2010 to visit Booths and acquire brake cylinders from recently arrived 37698. The rusty unserviceable ones were easily identified being full of ice! By the end of the day we had rejected three, removed seven and sprayed two up for saving. We also managed to acquire some drivers brake valves and numerous internal items from our lists. Six months later, on 4th July 2010, a sample of the 17 brake cylinders removed during January, still in as-removed condition (complete with mounting plates in some cases) are seen. They might look rough on the outside, but all were inspected at Booths and considered to have decent insides, unlike some of the ones inspected. Four RRRG volunteers braved the freezing conditions on 4th January 2010 to visit Booths and acquire brake cylinders from recently arrived 37698. The rusty unserviceable ones were easily identified being full of ice! By the end of the day we had rejected three, removed seven and sprayed two up for saving. We also managed to acquire some drivers brake valves and numerous internal items from our lists. 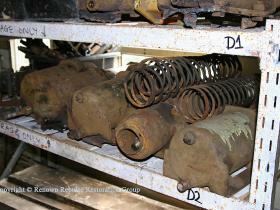 Six months later, on 4th July 2010, a sample of the 17 brake cylinders removed during January, still in as-removed condition (complete with mounting plates in some cases) are seen. They might look rough on the outside, but all were inspected at Booths and considered to have decent insides, unlike some of the ones inspected. New turbo air pressure gauges for 50030 Overhauled turbo air pressure gauges ex-Class 37. January 2010. 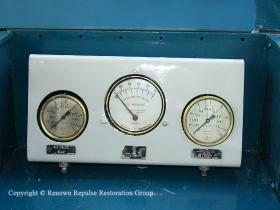 Overhauled turbo air pressure gauges ex-Class 37. January 2010. Turbo air and oil pressure gauges ready to refit into 50030 Turbo air and oil pressure gauges ex-Class 37 refitted in Class 50 mounting plate. January 2010. 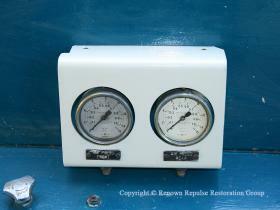 Turbo air and oil pressure gauges ex-Class 37 refitted in Class 50 mounting plate. January 2010. 50030 no 1 end cab No 1 end cab driver's desk refitted in 50030. January 2010. 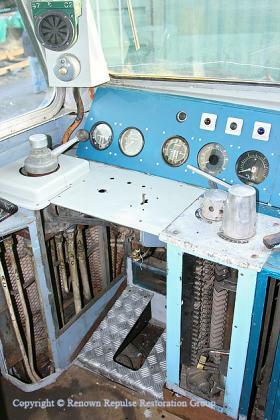 No 1 end cab driver's desk refitted in 50030. January 2010.